Certainly ear mites are a common problem in cats, but your doctor will detect this problem during it’s examination and recommend an appropriate treatment. Note that ear mites, like fleas, are resistant to many ear mite remedies available which explains why home treatment so often fails. Some individual cats, especially orange tabbies for some unknown reason are prone to heavy ear wax build up. Other cats are prone to facial allergies to include tender, irritated ears. The management of this problem needs to be discussed with your veterinarian which we will gladly do. And finally, some cats, especially those with white ear flaps, are prone to sunburn, solar dermatitis, or insect/fly attacks. 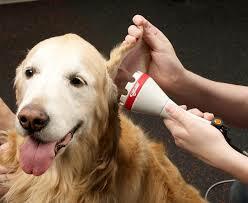 Laser therapy is best for this problem if severe, otherwise we have an effective ointment for these very tender ears. First, we recommend that a veterinarian check to see if you really do have a mite problem and not an infection. Or both. Usually, when we discover ear mites in your healthy kitten or cat, we flush your pet’s ear out with a strong suspension of ivermectin which is 100% effective in killing the adult mites but may not kill all the eggs so it's necessary to repeat the treatment once or twice more. Or better, use Revolution once a month to kill not only ear mites, but fleas, intestinal worms, mange, and heartworms too. Concentrated ivermec is nice and cheap but it's an off label treatment and not safe for weak kittens or patients with ear drum damage. - Revolution, which we highly recommend for all cats will kill ear mites as well as fleas, ticks, and heartworms, but you’ll get faster results if you first flush the ear out with ivermectin or baby oil. - Pyrethrin Based Ear Mite Drops are available in every pet store and catalog. They used to work ... just like pyrethrin based flea products used to work. Alas, the fleas are now resistant and so are the ear mites. These products no longer work well. Many dogs are prone to frequent ear infections. Especially dogs with ears that flop down over their ear canal. 1. The tissue and glands inside the ear become ALLERGIC and hypersensitive to either certain foods, fleas, pollens, molds, etc. Because of this hypersensitivity, the glands and tissue become red, inflamed, and produce extra wax and other secretions. 2. Because the ear canal tissue is inflamed and oozing secretions, it becomes infected with BACTERIA and YEAST. 3. Bacteria and yeast multiply and multiply and invade deep into the tender ear tissues excreting ODOROUS toxins that cause PAIN and severe INFLAMMATION. Luckily, we have some products that usually do a great job of killing the bacteria and yeast, soothing the painful ear, repairing the damaged ear canal, taking away the extreme itching and inflammation, and controlling the allergies. But take note; we almost NEVER cure ear problems due to underlying allergies.... we MANAGE them and keep them calm and under control. Once again, laser treatments help reduce pain, inflammation, swelling, and infection, so very helpful as an adjunct treatment for ear problems. Highly recommended in more severe cases. Inexpensive, soothing, low pH, and a very gentle way to keep ears clean which prevents infection. With or without added antibiotics. Tris EDTA Ear Flush: For severe ear infections due to the bacteria Pseudomonas. This type of ear infection is not too common, but if your dog has an extremely severe ear infection, we will perform a test telling us which type of bacteria is causing the problem. If Pseudomonas is present, then using Tris EDTA Ear Flush, usually with antibiotics added, is an important step in the cure. Zymox HC Ear Drops: This natural, enzyme combination solution is our most successful treatment of painful ears infected with pus and yeast. This stuff is amazing. Most vets are still selling "Panacur" or similar ointments for most routine ear infections and don't know about Zymox which works 10 times better. It's also easier because once a day is enough. But, as fantastic as Zymox is at removing pus and inflammation from the surface of the ear canal, about 20% of ear cases require different or additional treatment. Malotic Ointment Rx (generic Panacur) Having just criticized Panacur in comparison to Zymox in the paragraph above, sometimes Malotic works too. It's about half the price and it's a good all purpose ointment for minor wounds, athlete's foot, paw infections and so forth. Antihistamines: Inexpensive benadryl, chlorpheniramine, or more potent hydroxyzine HELP make allergic ear dogs more comfortable, less itchy, and may prevent future ear flare ups. Super safe for most pets and while usually not enough to control the underlying allergies completely, they often help. Very inexpensive. Ask us about the appropriate dose for your size dog. Oral Antibiotics and Oral AntiFungal Medications Rx: While we can control most ear infections with excellent topical treatments like Zymox, Mometamax, or Posatex, if the infection has penetrated deep into the ear tissue or has gotten into the middle or inner ear, then systemic antibiotics and sometimes systemic anti fungal medications are needed. Sometimes long term. Douxo (Phytosphingosine) is a micro-emulsion, natural product that's very effective at healing flakey, damaged ear tissue. You apply a few drops once a week as a supplement to other treatments. Omega Fatty Acid Supplements improve the quality and nature of the extracellular fluids that nourish connective tissue including skin and ear tissue. That makes them helpful in healing damaged ears and reducing inflammation. Duralactin Chewable Tablets or other pain management: Duralactin is a natural, gentle, and pretty effective enzyme medication for pain and inflammation. Excellent for painful ears as well as arthritis, bladder infections, and general aches and pains. Sometimes we dispense more potent pain meds for a few days and/or recommend laser therapy to get the initial pain and swelling under control. HypoAllergenic Diets and Treats: Once again, most dogs that have frequent or chronic ear problems have these problems because of underlying allergies that keep the ear tissue tender, red, and inflamed. Most of the time, inhalant allergens like pollen, dust mites, and dander are the main culprits. But about 20% of the time, food allergens are a big factor and switching to a hypo allergenic diet makes a big difference. Thyroid Testing, Cytology, & Ear Cultures: Not all ear problems are simple or associated with allergies. A good examination and some lab tests are often needed to get a good diagnosis and treatment plan.